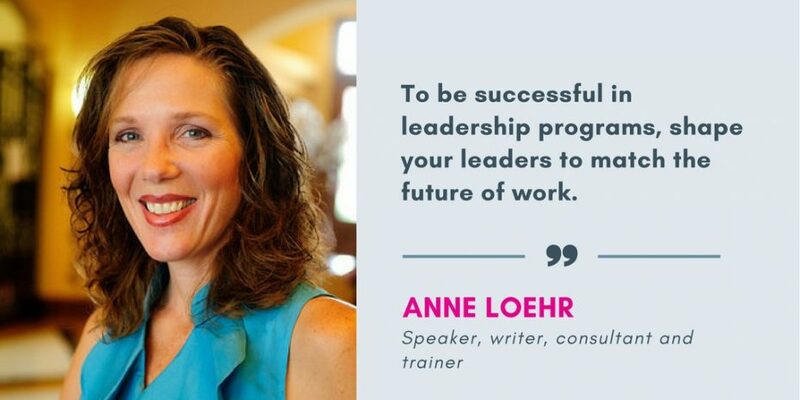 Anne Loehr is an internationally sought after keynote speaker, writer, consultant, and trainer. 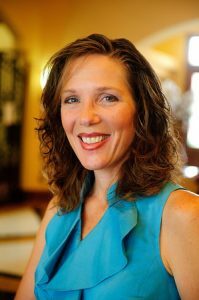 She helps leaders in large organizations connect today’s everyday decisions to the future workplace. Her end goal is to help organizations retain their top talent and not only survive, but thrive. To learn more about Anne, check out www.anneloehr.com or follow her on Twitter. There is a disconnect between the future of work and what women’s leadership programs purport to do—develop our future female leaders. This description uses language which reflects two outdated assumptions about leadership. First, that hierarchy is a given. And second, that “moving up” is valued by all women leaders. Leadership programs that use both of these common assumptions point to a larger issue: non-inclusive language. Using forward-focused assumptions and inclusive language will make leadership development programs more successful for both individuals and organizations. So let’s take a closer look at these assumptions. The future of work will be stripped of centralization. Instead of ladders and chains of command, the future organization will function like an ecosystem — a community of interconnected organisms that all work in conjunction with each other in a complex environment, where members play many roles. In addition, individuals don’t have to ‘move up’ to be a leader. Individual contributors, those who do not manage employees, are just as valuable as those who manage employees. Yet it is assumed that to be a leader, you must manage employees, which naturally precludes the individual contributor from the typical leadership pool. In the US, flexibility ranked as one of the most important factors when looking for a new job or deciding what company to work for. If women — and men — value work flexibility, using old workplace assumptions will no longer work. Working 80 hours a week, in a bricks and mortar office, was the accepted norm for moving into past leadership roles. No longer. The amount of people who work at home has grown by 103% since 2005, with 3.7 million employees now working from home at least part of the time. Even more telling is that the employee population as a whole grew by 1.9% from 2013 to 2014, while the population of employees who telecommute grew 5.6%. With technology, we can work anywhere, and stay connected even when we’re not physically sharing space. This type of freedom is shaping the future of work, and future leaders will be part of the continuation of that shift. What Does Language Have to Do With It? In an attempt to keep women’s leadership development programs inclusive to women, organizations end up doing the opposite, by signifying what types of men are invited to join. For example, I’ve seen women’s leadership programs offer a place for men “who get it’. If we only invite men “who get it”, what does that say about other men? That they aren’t sophisticated, informed, or wise? This creates a divide between those who are invited to the leadership space, and those who are not. Even women experience a lack of inclusivity into programs supposedly developed just for them. The language often used to describe future leaders is ‘high potentials’, ‘emerging leaders’, or ‘next gen’ leaders. All of this assumes that the future leaders are young and focused on being leaders early in their career. This type of line drawn in the sand, where the potential leaders are on one side, and the “regular” people are on the other side, starts early. My daughter’s elementary school separates children into gifted programs starting in third grade. That’s quite young to feel that some people have high potential and others do not. That designation can define a child as they develop. “I’ll never be a leader,” might be a decision a third grader makes just because she wasn’t invited into the gifted program—a decision she takes along with her well into the development of her career. Hold a meeting of diverse team members who will review the leadership development program. Have everyone ferret out the assumptions and exclusions they can find in the language used. Look at the assumptions identified to ensure they aren’t based on how work has always been, but on how it is evolving into the future. Review who you are inviting, and excluding, with the language used to explain the program. How can the language be more inclusive? Make changes to reflect those observations. The reality is, who you invite to participate in leadership solutions and the language you use to frame those problems is itself shaping the future leaders. To be successful in leadership programs, shape your leaders to match the future of work.